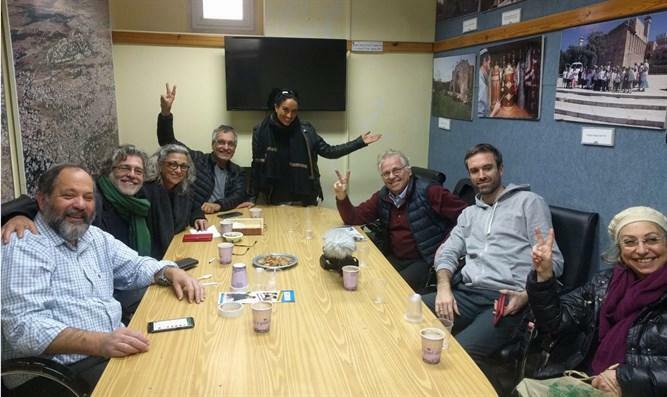 Israeli singer Ahinoam Nini and European political activist Daniel Cohn-Bendit visited Hebron to meet with local Jewish residents and film a documentary. A top-selling musician, Nini hit the scene in the 1990's performing as "Noa," with guitarist Gil Dor. In 2009 she represented Israel at the Eurovision Song Contest in 2009 together with Arab-Israeli singer Mira Awad. Yishai Fleisher, Hebron's international spokesman, said that while Nini's outspoken political views may not be in line with his, "I was impressed with the fact that she came and she told us that she was impressed with our willingness to dialogue." Noam Arnon, Hebrew-language spokesman for the community said, "the meeting was very pleasant. We drank coffee and ate cookies and agreed to disagree." He noted the Habima theater visited Hebron several days prior following a performance in nearby Kiryat Arba. The Tel Aviv-based theater company's first performance in Kiryat Arba in 2016 elicited controversy among those who oppose Jewish communities in Judea and Samaria. Arnon said he told Nini and Cohn-Bendit that he believed one should love their neighbor whether Jewish or Arab, as long as those neighbors do not attack you. But added, "only Jewish sovereignty will guarantee the peace and security of all in this region." Arnon stated that contrary to her media image "she did not say anything arrogant or defiant." Cohn-Bendit arranged the meeting as part of a documentary film in which he intends to present a range of different Jewish identities. Born in France to German-Jewish parents who fled the Nazis, Cohn-Bendit went on to lead the Paris student protests in 1968. In recent years he served as a Member of the European Parliament and as co-president of the European Greens–European Free Alliance.